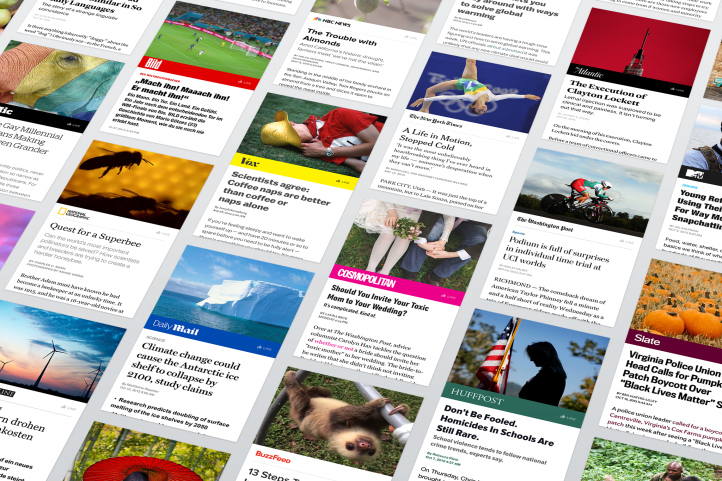 Back in May, Facebook announced a new product called 'Instant Articles', a new type of content format that looks to change the way readers experience content on Facebook. Instant Articles are posts that are uploaded directly to Facebook - so rather than a publisher posting a link back to their site to get readers to view their content, media providers would be able to have their content hosted on-platform, which reduces load time, improves performance and gives creators access to a whole range of new tools to use, like in-post video and interactive images. Despite the initial pitch, we've not seen a heap of Instant Articles flowing through our News Feeds as yet. But that's about to change - today, in an official post on the Facebook blog, The Social Network announced that Instant Articles are coming, and in a big way. Today Facebook launches Instant Articles for iPhone - a beautiful new way to read articles in News Feed that is faster and more interactive than ever before. Starting today, everyone on iPhone can read thousands of Instant Articles from your favorite publishers every day. Look for the lightning bolt on the top right corner of some stories shared in News Feed. The lightning bolt indicates it's an Instant Article. When you tap the story, it loads ten times faster than a standard mobile web article and the reading experience is beautiful and interactive. Check out this short video to see what Instant Articles look like. We hope you love it as much as we do. In a new post on the Facebook Media blog, Facebook Product Manager Michael Reckhow announced that everyone who uses the Facebook for iPhone app will now be able to read 'thousands of Instant Articles every day'. You read that right - 'thousands'. From now on, when you see an article in your News Feed, there'll be a lightning bolt in the top right corner of some, highlighting them as Instant Articles, meaning they'll load 'ten times faster than a standard mobile web article'. 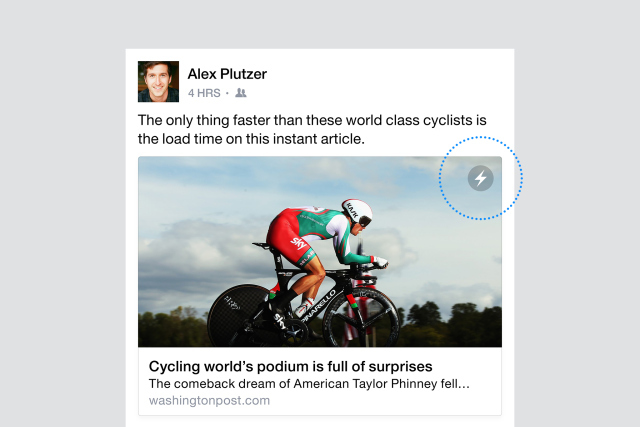 The end result is a great looking, fast loading, immersive reading experience, all hosted within Facebook. Even better, readers themselves don't have to do anything new to share Instant Article content - when you share a link, Facebook will cross-check that content and display the Instant Articles version, if one exists. The expanded Instant Articles experience is great for Facebook, and looks great for readers - but what about publishers? Are they also set to gain through this new offering? This is the biggest question mark on Instant Articles - will publishers ultimately lose out by giving up website traffic in order to build audience on Facebook? At the moment, it's hard to say. Facebook's offering publishers a revenue share deal on any ads they sell within their Instant Article content, as well as improved, third-party data tracking options to add more transparency to the process and ensure publishers don't lose relevant audience insights. In testing, Facebook noted that users have been more likely to share Instant Article content than they would normal posts, so there will likely be reach benefits - whether that's enough to offset the possible reduction in the publishers' own website traffic is really going to be a case-by-case proposition. But definitely, there is an inherent risk to publishers - as noted by TechCrunch editor Josh Constine, both Instant Articles and Twitter's new 'Moments' feature reduce the connection between publishers and their audience by removing much of the identifiable links which are displayed on content currently - things like promotions and subscribe buttons. In doing this, the content itself could really come from anywhere, and over time, this approach could reduce the relevance of individual publishers in favour of these new content options. As part of today's announcement, Facebook has noted that fourteen major publishers are already using Instant Articles (those highlighted above), with close to another 50 set to come on board shortly, including Billboard, Bleacher Report, Business Insider, CBS News, CNET, Complex, Cracked, E! News, Harper's Bazaar, Mashable, NBA, NY Post, The Onion, People, Rolling Stone, Seventeen, TIME, USA Today and Variety. Given such a wide variety of publishers look set to be jumping on the Instant bandwagon, other publishers may find it difficult to resist, particularly if the reader response to Instant content is positive. And by looking at how Instant Articles work and what's on offer, there's a good chance they will be well-received - Instant Articles could quickly become the norm, a move that could further shake-up the online media space and re-shape publisher strategies moving forward. Ultimately, the real winner in this equation is going to be Facebook. Facebook's main driving ambition - to keep people on Facebook, all the time - relies upon them being able to provide additional functionality and tools that provide all the internet in one single place. In line with some of their other new projects, like on-platform shopping, a new, individualized video content feed and the addition of services like it's 'M' personal assistant project, Facebook is advancing, everyday, towards that all-encompassing vision. Instant Articles is another step in this process, and given Facebook's dominant audience share, The Social Network is well-placed to increase its market standing and boost that ever more important stat of daily on-platform engagement (as of Facebook's most recent earnings report, users are spending 46 minutes per day, on average, across Facebook, Instagram and Messenger). Facebook CEO Mark Zuckerberg has repeatedly re-stated that his ambition with Facebook is to 'Connect the World'. But really, we know that there's more to it than that - it should read 'Connect the World... to Facebook'. And that's not necessarily a bad thing, Facebook's only able to expand their empire because they're providing functionality and tools that people want, that increase the network's utility and applicability in our day-to-day lives. If they ever fail on that front, users will turn away - Facebook knows this, which is why all these new functions benefit us, the users, more than anyone else. And really, Facebook wins by gathering attention. Yes, there is a risk that Facebook could let publishers build audiences on the platform through Instant Articles, then change the rules, as they did with brands whom they initially encouraged to gather Page likes to boost reach. But really, Facebook will keep winning so long as it can hold our collective attentions, and expand upon the amount of time spent in doing so. The more they're able to do this, the more they boost the value of Facebook as an advertising platform - and Facebook's already, arguably, the greatest ad platform ever created. In that sense, it's to Facebook's benefit to work with publishers, as well as their audience - the more they can do both, the higher the chance that Facebook continues to win, long-term. How that equation evens out to make it equitable for all sides remains to be seen.